As part of our mission as an educational foundation, ICNC promotes the teaching of civil resistance in academic institutions and beyond, whether through classroom-based, online, or hybrid courses. We particularly encourage applications from educators who do not currently teach civil resistance at the institutions where they want to develop the new curriculum unit. We also prefer that the institutions currently have no courses on civil resistance offered as part of the departmental, school, or university curriculum. The curriculum fellowship is designed to plant a seed for continued education on civil resistance. Applicants should therefore be able to demonstrate that their curriculum is part of a long-term, sustainable teaching plan, as opposed to being a one-off course offering. 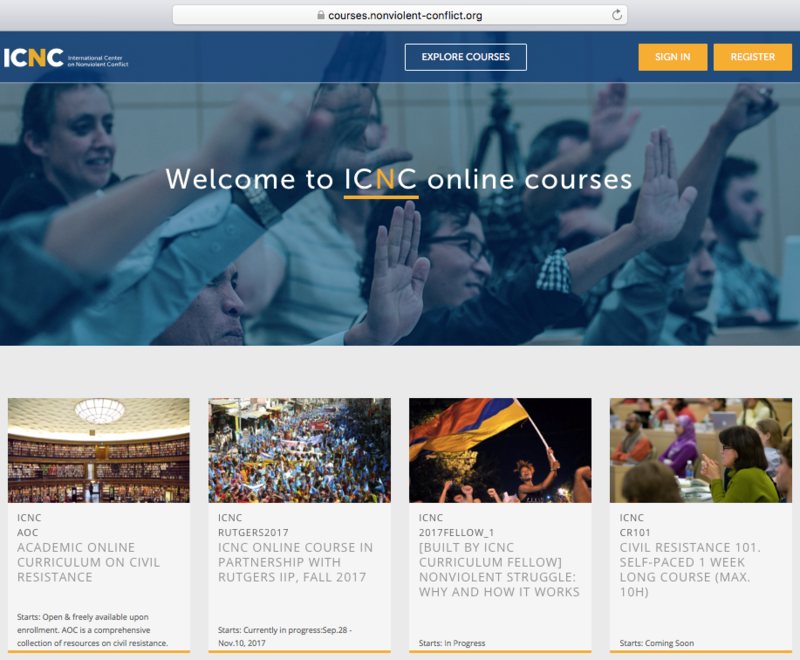 Applicants for ICNC’s online curriculum fellowship are expected to develop either a full-term oonline course or a curriculum unit on civil resistance that, at minimum, consists of a minimum of 5 weekly online sessions on civil resistance in which participants are asked to review relevant session notes, videos, and readings and then engage in forum discussions moderated by a seminar instructor. Each fellowship grant will involve a stipend of $1,300 (though if it is a team proposal the fellows will split the grant). Fellows will be expected to set up and offer their online teaching on civil resistance through the ICNC Online Courses platform unless this would violate your institution’s policies. Application deadline: May 27, 2018. Interested also in developing and teaching classroom-based courses? Check this curriculum fellowship call for classroom-based courses. Interested also in developing and teaching hybrid (classroom/online) courses? Check this curriculum fellowship call for hybrid courses. What is civil resistance and why does it matter for your students? Civil resistance education is emerging as an important element of the college-level educational experience, with a growing number of courses on civil resistance offered at various universities, including in the areas of conflict, peace and security studies, political science, international relations and sociology. As an interdisciplinary topic, civil resistance intersects various academic disciplines: politics, history, sociology, social-psychology, international relations. A specialized course on civil resistance can offer students knowledge and skills that are relevant to advanced studies in the social sciences. At the same time, students who may be interested in careers in foreign policy, government, community organizing, or civil society organizations can find a course on civil resistance to be a career-oriented learning opportunity. As nonviolent civil resistance movements increasingly shape international affairs and domestic politics in countries around the world, government and civic actors, as well as journalists, are increasingly likely to encounter this phenomenon in their work. In such cases, knowledge about civil resistance movements can constitute an additional career advantage. Such a course may also enhance the students’ skills and commitment to be active citizens in their communities. Adult educators and trainers who might work in civil society organizations, but have academic-based training or pedagogical and teaching experience, particularly those working in regions and countries with restrictive civic spaces or conflicts. In 2018, up to seven curriculum fellowships in total, each in the amount of $1,300, will be offered to qualified applicants teaching classroom-based, online, and hybrid course. Applicants for online fellowships will need to create a detailed curriculum plan and then teach either a full online course on civil resistance or at a minimum a civil resistance unit or semina of at least five weeks. The proposed curriculum can be offered to students and interested learners from applicant’s university, town, district, country, region. Unless it violates institutional policies, the online course or unit would be given through the designated ICNC’s online platform. In addition to a curriculum fellowship grant, awardees will receive staff support and advice on curriculum planning issues and a package with academic books and documentaries on civil resistance. ICNC provides these resources free of charge as part of its curriculum fellowship package to help its fellows develop the content and pedagogy for the course or unit on civil resistance. Teaching for 2018/2019 ICNC Curriculum Fellowships is expected to take place either in Fall 2018 or Winter/Spring or Summer 2019.
a. Once selected, fellow will be expected to develop an online seminar, though customized to fit their own teaching environment, learning objectives and audience. The seminar must consist of a minimum of 5 weekly online sessions on civil resistance. b. Limited technical assistance from ICNC will be available to help fellows learn basic functionality of the ICNC Online Courses platform to be able to build their own courses. ICNC will provide fellows with an instructors guide. e. fellow moderates the course online in its different forums where learners comment on the materials reviewed and exchange ideas about specific topics and respond to moderator’s questions. o. fellow develops online follow-up survey for students to complete 3 months after the course ends. The fellow is responsible for sending the follow-up survey to their students. To be considered, applicants should review ICNC recommended list of resources, fill out the online application form, submit CV and curriculum proposal, and other information as requested. The curriculum proposal should include a detailed description of the content for at least five weekly online sessions on civil resistance in which participants are asked to review a relevant session description, videos, and readings and engage in forum discussions moderated by a seminar instructor. Once the applicant is selected and becomes familiar with the ICNC online learning management system, s/he will set up the proposed curriculum (with any requested modifications) on the designed space within the ICNC online learning platform. Application deadline: May 27, 2018 for online courses that will be offered in Fall 2018 or Winter/Spring or Summer 2019. ICNC translations: if a proposed course is taught in a language different than English, a fellow will be expected to incorporate translations of civil resistance literature available in the ICNC library, which houses materials on civil resistance in 55 languages. Applicants’ curriculum proposal – to be submitted as part of the application process – is expected to include a list of resources on civil resistance that an applicant plans to incorporate into an online seminar and is encouraged to identify a potential guest speaker suitable for a proposed civil resistance topic. The fellowship grants will be disbursed in two equal installments. The first installment will be made after the course begins, the student enrollment is confirmed and the syllabus with an online civil resistance content has been set up and satisfactorily reviewed by ICNC. The second installment will be made after the online seminar ends and ICNC receives fellow’s final report and results of students’ evaluations pertaining to their learning on civil resistance and course assessment.